YWP achieved an overall 4.5 out of 5 mark to enter the 2015 TripAdvisor Hall of Fame, which can only happen when an attraction manages five consecutive years of the top award. Director Cheryl Williams said: “This is a remarkable achievement. We continually strive to improve the visitor experience and this accolade is proof we are succeeding. YWP has now clocked up an incredible 1,662 Excellent ratings from its 2,605 TripAdvisor reviews with praise coming from groups, families and individual visitors. 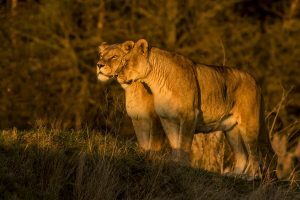 Since opening in 2009 YWP has become the UK’s fastest growing and most innovative attraction. Last year 550,000 visitors enjoyed the innovative walk-through experience giving them unrivalled access to some of the most beautiful and endangered animals in the world, including Amur Tigers and Leopards, Giraffes, African hunting dogs, polar bears and many many more. It has attractions for all the family with the 600 sq m Safari Village, complete with its own café and a large shop, also features outlets selling crafts, artwork and décor. There is also the weather proof Monkey Play Barn where children can enjoy three levels of climbing frames, dens, slides and rope bridges – in full view of the new baboon reserve through a glass wall.